During the Hong Seong Project I was impressed many times by DVO Staff's great team work. I could read it was the result of good leadership. If we can have such a great partner for next project too, this will be the most splendid thing." DVO's new Phosphorus Recovery system works as advertised. We previously operated a full-scale centrifuge...but the extra amount of polymer required for the centrifuge was just not cost effective – and still did not result in the same amount of capture of phosphorus. We are achieving better results with 1/3 the operating costs when figuring for chemistry and electrical costs, not to mention maintenance. According to WSU we're removing and recovering over 90% of our phos – AND putting a meaningful dent in our nitrogen too. The amount of solids and nutrients removed by this system are unbelievable. The liquid coming off it is semi-translucent. The solids are stackable and manageable. DVO and their Washington representative, Regenis, have been terrific people to work with. DVO has added additional value to our anaerobic digester, and far exceeded our expectations." Manure has a lot of value.” “We are powering ourselves. In approximately 5 years the electrical savings will pay for the costs of the project. The savings will only continue as long as we have cows.” “We are the ‘ultimate recycler!’"
When a business such as ours makes an investment of this size the consensus from our family was to go with the proven technology. For us that meant DVO." We would never do any dairying without a DVO digester. Even if the electricity and manure solids sales made it only break even, the other benefits the system brings to a dairy would still make the digester essential." DVO, a great company to work with. The experience of building a digester is stressful for a dairyman. However DVO made it a pleasant and fun journey. 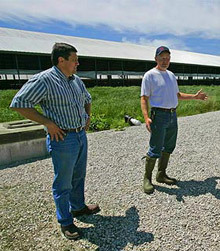 They have a team of people to work with and understand the fundamentals of dairyfarming. They took care of all details from writing grants to helping with design and installing the last manure pump. They have my philosophy of keeping things as simple as possible on the farm. However the most important part of their company are the people. Simply a great group to work with." My dream and Sue’s dream — and people look at me like I’m crazy — is to have a zero-carbon-footprint dairy. And I believe we can get there." My customers are paying for the digested liquid from Holsum’s digester, and fighting over the limited supply – because crop yields are so much better where they spread the digested liquid." What is really amazing is what you don’t see or actually, smell. Spending the better part of the past two and a half years down here, I thought that I had just grown accustomed to it. But that’s not it. The odor now is virtually gone." Manure digestion brings great synergies to the table for crops, the environment and a farm’s balance sheets." With the bedding situation out there-sawdust and shavings are hard to come by...I'm more or less doing it to get the bedding." We needed somebody who knew even more about digesters. We ended up talking to Steve Dvorak. A lot of vultures descended on us, said they were engineers. They really didn't have too much to offer when it came right down to specific questions. Steve had a lot of good ideas, a lot of answers, and experience. And so, after visiting with him a few times it was pretty obvious that we'd be able to work very well with him. So we went with DVO." The advantages are just unreal: pretty much get rid of the odor; we can use bedding out of the fiber; defer some costs by making electricity, and it's green electricity, which our environmental people are interested in. The fly problem is pretty well gone; pathogens are gone; nutrient value of the manure that we're hauling out, the nitrogen is more stable, the phosphorous more available; and the neat thing is the manure we're hauling out is going into the digester at a pH of 6.8, 6.9 - it's coming out at a pH of 7.8 to 7.9. So we're getting a neutralizing value in the manure; besides, there should be a savings in lime as we get down the road. So, with all the features of the whole thing, it's pretty much a win-win thing for the community and the environmental concerns and everything." Gordon's system has been very reliable. 'A farmer should not invest in a digester solely to generate electricity,' he says. He recommends that farmers do the same by investing in a system that 'has an excellent track record.'" The digester allows us to have another source of income. Now we're producing electricity along with milk. It's a secondary revenue stream that is independent of milk prices. We also use this as a way to be better neighbors. The odor issues that the dairy used to experience have been minimized to the point of being negligible now. We're very proud of it. It makes us better neighbors and that's something that we set out to do for that reason." There are now more and more digesters coming in. I would call them '2nd wave' digesters. I think it's a benefit to the environment, I think it's a benefit to the state, I think it's a benefit to our power grid. It's a good thing." The digester setup, which has been constructed at this site, has virtually eliminated all manure odors.... Taking into consideration the number of animals at this site [3,300], the aroma is better than one would expect from a 100-cow operation without a digester."